Waterbury Calendar No. 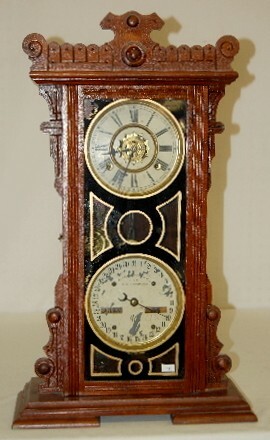 44 Clock, Walnut 8 day time with half hour gong strike on a cup bell striking alarm; original dials. The clock is running and striking at this time. (The dials are losing their paint; the paint on the glass shows wear.) 23 1/2"